request your FREE guided tour now! 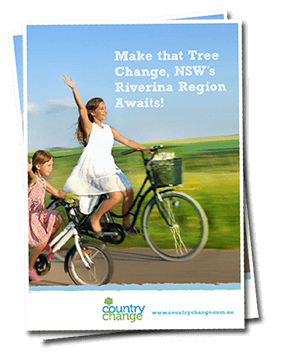 Country Change exists to help you make the move to Riverina, NSW. If you’re craving a tree change, NSW Riverina Region is filled with spectacular natural scenery, exciting inland cities and picturesque country towns, and we’d be honoured to show you them all! If you’re planning to visit Riverina, tell us about it! We can help you plan to get the most from your visit! With so many great sporting, dining and cultural options, any time is a good time to visit Riverina. With a lively arts and events calendar, you may wish to plan your visit to Riverina to coincide with one of our events. From black tie balls to exciting weekend festivals to footy grand finals, ask us to help you plan to see the Riverina you’ll love! There’s plenty to see in the Riverina region, but if you’re thinking of a move to the country let us help you plan your visit to ensure you don’t miss the important things. By allowing us to help plan your visit to Riverina, we can arrange visits to the Riverina towns on your shortlist. If you’re moving to the country for work, we can arrange tours of local schools, meeting with job network staff and real estate agents.